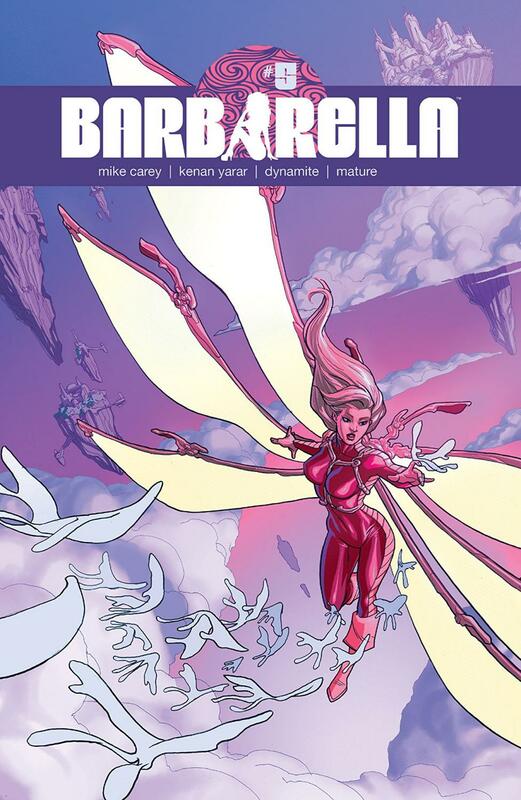 With issue 5 of Barbarella, we get to follow her as she embarks on a new adventure that will take her, gods know where - and that is okay, because this should be crazy sci-fi action and that is what we get. The issue starts off innocently enough: Barbarella has made a pitstop to have her ship fixed up and stays the night as it is being worked on. However, after barely settling in, she is confronted by a ghost child (that she knows) who sends her to Van Neumann’s World where she is to get herself a Grubstake and do some prospecting. However, this isn’t some old regular prospecting for minerals. Nope. She’s prospecting for Radically Unstable Space-Time (or R.U.S.T.). While there, Barbarella encounters some locals, who are equivalent to old-timey prospectors that have lived generations on their land and who have quite the aversion to newcomers, as well as a scientist who is looking for answers rather than a payout. Sometimes the best sci-fi stories have a grain of realism in them and this issue is the perfect example. You could easily tell this story in the old West for example, but it is made that much better being set on a far-off planet beset by unstable space-time. Having said that about the story, the pencils from Yarar continue to impress in this issue. His style is very european and as I’ve mentioned, would fit well in those old-school european comics and I love that. His characterizations and staging of action scenes are also on point and add to the story in all the best ways. I continue to thoroughly enjoy his work and this series.